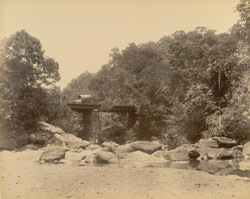 Photograph taken about 1900 by the Government photographer, Zacharias D'Cruz of a general view of the Kalduritty river in the erstwhile Travancore State. It is one of 76 prints in an album entitled 'Album of South Indian Views' part of the Curzon Collection. George Nathaniel Curzon was Under Secretary of State at the Foreign Office between 1895-98 and Viceroy of India between 1898-1905. The Kallada river, is the third largest river in Travancore, discharging water into the Ashtamudi kayal or lake. It is a confluence of three rivers: the Kulathupuzha, the Chenthorni and the Kalduritty. It flows through the taluqs of Pattanapuram, Kunnattur, Kottarakara and Quilon.